SEOUL, March 18 (Yonhap) -- U.S. hedge fund Elliott Management said Monday that its dividends proposal for Hyundai Motor Co. and its auto parts affiliate Hyundai Mobis Co. will not affect their liquidity or future investment plans. The hedge fund made the claim regarding the ongoing dispute over the firms' dividend plan for this year. Elliott proposed that the two firms pay a combined 8.3 trillion won (US$7.3 billion) in dividends this year at the upcoming shareholder meetings. Bashing the "excessive" calls, Hyundai Motor offered to pay 1.1 trillion won to shareholders for its business performance last year, and Hyundai Mobis offered to deliver the same amount but spread over the next three years. "The group has sufficient liquidity for its investments even after the dividend proposal," Elliott said in a release. Noting that Hyundai Motor and Hyundai Mobis have over 21 trillion won and 10 trillion won, respectively, in cash, the hedge fund said its dividend resolution only reduces their gross cash balance by 25 percent. "(The two Hyundai firms) have accumulated so much excess cash by retaining profits over the past five years ... and have failed to efficiently manage the cash," it added. Stressing that share prices of the two Hyundai firms have "meaningfully underperformed peers (for) many years," the hedge fund said its proposed resolutions "to address its balance sheet problems and poor corporate governance are important first steps to move Hyundai Motor Group forward." But South Korea's state pension fund, the National Pension Fund, and five key overseas pension funds have sided with Hyundai's proposal. 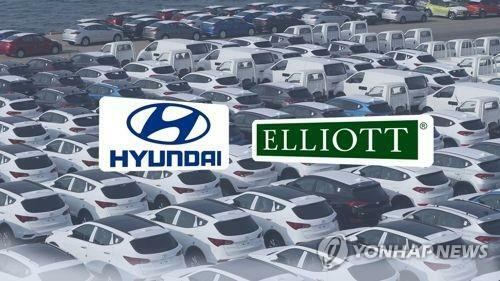 Investors in Hyundai Motor will vote on the proposals made by the company and Elliott at the meeting slated for Friday.